In its first dalliance with the People’s Republic of China after over a year of quiet, the United Kingdom has made a series of deals, or overtures to deals that may be giving more favorable conditions to China than is necessary, according to analysts. The week of meetings with Chinese officials and public appearances by Conservative Party politicians in China, most prominently the dashing mayor of London, Boris Johnson, and the Finance Minister George Osborne, has borne a variety of fruit. These include promises to relax onerous visa restrictions making it difficult for Chinese to stay in the U.K., indications that Chinese banks may receive special conditions if they set up in London, and the allowance of potentially significant Chinese investment in the crucial nuclear sector. Around a dozen Chinese companies, in turn, are said to have signed up to an Asian Business Port in London that will create 20,000 new jobs, according to the state-run China Central Television. But there are a series of important footnotes to the U.K. concessions that, taken in a broader context, raise questions about whether the country could have played its cards better, or whether it may be better off seeking the strength of allies and partners, against a regime that is not known for mercy in its international conduct. Since May 2012, when British Prime Minister David Cameron met with the Dalai Lama, for whom the Chinese Communist Party reserves particular vitriol, relations between China and the U.K. have been cold. This may have been for a variety of reasons, but the recent dealings are the first major thaw, and were trumpeted by the Chinese Communist Party’s own newspaper, the People’s Daily, as evidence of a political victory for the PRC. “China pursues a strategy of openness and mutual-win, but it will absolutely not make deals with its core interests, and absolutely will not tolerate other countries casually damaging China’s rightful interests,” the newspaper said, under the byline of “Zhong Sheng,” an author often used to deliver nationalistic messages. “Doing whatever you like and harming China’s interests, hurting the feelings of the Chinese people, and then fantasizing that China will be ‘politically cold and economically hot’ is absurd and infantile,” the article announced. It is unclear if British politicians had privately apologized on the recent trip to China, but in December of last year Prime Minister Cameron was revealed to have ordered a “blanket prohibition” on ministers meetings with the Tibetan spiritual figurehead, according to British media. Comments he made to a recent House of Commons meeting also seemed improperly contrite, according to Alison Reynolds, the London-based executive director of the International Tibet Network, a coalition of Tibetan activist groups. 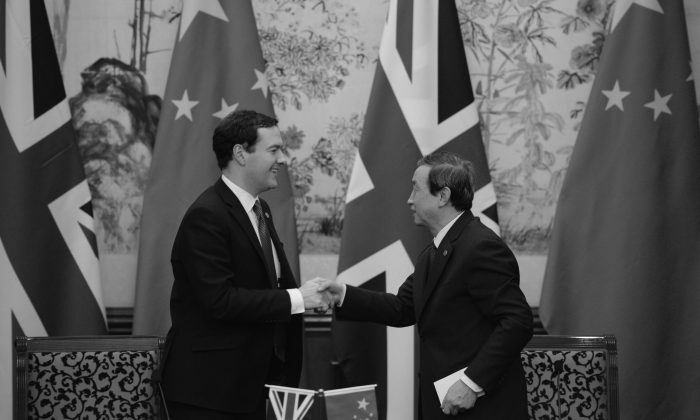 The same dynamic appears to underlie the PRC’s dealings with the U.K. on trade issues. “All this buttering up of the Chinese by individual governments is not making the European Union any stronger as a force to be reckoned with,” said Guy de Jonquières, a senior fellow at the European Centre for International Political Economy. “China has been exceedingly adept at dividing and ruling, with willing assent of member governments. When individual European countries go asking for favors from China,” it tends to put them in an inferior position, he said via telephone. “You’ve got to recognize the Chinese for what they are. They recognize power, above all else, and they’re in this for the interests of the Party and the interest of China. They will play very hardball. That’s the nature of the game,” he also said. Member governments of the European Union “playing every man and woman for himself,” as the United Kingdom is doing presently, doesn’t encourage the Chinese to see the EU as a coherent body with which it needs to negotiate, de Jonquières said. The most controversial prize that China may be granted involves the U.K.’s nuclear sector, which the U.K. government—having committed itself to reducing reliance on fossil fuels—is now trying in earnest to get underway. During the Johnson and Osborne’s trip to China, the Chinese were offered the opportunity to invest in, and later potentially operate, nuclear power plants in the U.K., according to recent statements. The latter has not yet come to pass, but “if the Chinese were operators of nuclear in the U.K. … they would have access to full knowledge on how the grid works, backup systems, emergency planning and so on,” writes Nick Butler, a visiting fellow and chair at King’s College London, in an email. This is aside from the question of cyberespionage emanating from China, some of which has been shown to be conducted by Chinese military entities. “If the Chinese wish to be treated as equals in a global market economy, they should stop this activity,” Butler wrote.